With its central location in the heart of the Granite City, this hotel is an ideal base for exploring the city’s architecture, nearby castles, whiskey distilleries and sandy beaches. This modern hotel features polished rooms with custom-designed beds, ergonomic seating, flat-screen TVs, and Wi-Fi. Enjoy a sumptuous meal at the restaurant and bar, and keep up with your workout routine at the fitness center. 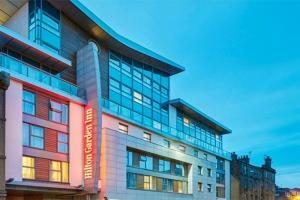 Union Street shopping district is a 5 minute walk from the hotel, and Aberdeen Airport is a 20 minute drive. Aberdeen Art Gallery, Marischal Museum, Aberdeen Arts Center, Aberdeen Maritime Museum are all less than a 10 minute walk from the hotel.